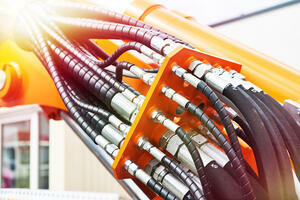 A hydraulic system’s design needs to focus on the required working pressure of the application. To do so, the working pressure of the components must coincide with the system requirements. The components for the system are then selected to ensure safe and acceptable service life. There are a number of factors to consider when selecting the hose fitting, including the compatibility of the fitting to the hose, one or two piece design and the correct assembly. ONE-PIECE HOSE FITTINGS: One-piece hose fittings have a ferrule that is pre-crimped onto the hose fitting. The advantage being that the collar will not slip out of alignment. This style also ensures the correct ferrule is matched to the correct fitting. One-piece hose fittings are good for basic applications and quick assembly. TWO-PIECE HOSE FITTINGS: The ferrule used with two-piece fittings allows greater flexibility in hose selection and connection, including 1SN, 2SN and multi-spiral hoses which allow for multiple two-piece fitting and ferrule options to accommodate the specific application. Stainless 316 two-piece hose fittings are the best selection to ensure corrosion resistance and long service life, especially in chemical and offshore applications. In these critical applications where 316 stainless is used, the end user may require the hose fitting manufacturer provide material traceability. Two-piece hose fittings are used for these critical and exceptionally high pressure applications, particularly when there is the possibility of extreme hose vibration and/or pressure surges. When severe conditions are present near the fitting components, two-piece hose connections are highly important for providing a powerful assembly of the fitting and hose. In these high pressure applications the hose is sometimes inside/outside skived (or 2 skive), creating a metal to metal connection on both the inside and outside of the hose. Standard hose tails cover a broad range of applications from textile hoses, one and two wire braided hoses, four spiral hoses (4SP), thermoplastic hoses and PTFE hoses. Interlock hose tails are used with higher pressure multi-spiral hoses. The cost of stainless ferrules is far less than the cost of their compatible tails. The key is to maintain a good balance of hose tails on hand with a large variety of ferrules that are made to work with specific hoses. In other words, carrying more ferrules than hose tails allows for lower costs while still maintaining the inventory customers require. This is very important when there is a desire to reduce the cost of maintaining stainless steel components. This blog is an excerpt from our latest white paper titled "Hydraulic Hose Fittings: Four Things to Consider". Click here or the link below to download!